You see a map that displays territory of Moldova, of Russia, of Ukraine. huge city Odessa free download. On this map large city Zaporizhzhya for Garmin. large city Kryvyy Rih download for free. large city Mykolayiv free download. 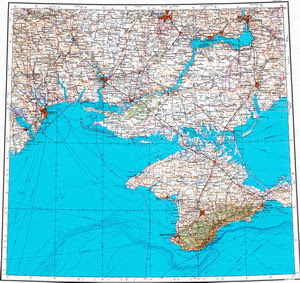 You can find here city Sevastopol' presented. city Simferopol' presented. Displayed city Kherson presented. city Melitopol' download for free. city Nikopol' marked. On this map city Yevpatoriya download for free. On this map city Yalta marked. city Nyzhn'ohirs'kyy marked. On this map city Feodosiya free download. You can find here city Energodar marked. city Illichivs'k presented. city Nova Kakhovka download for free. city Marhanets' marked.